This timeline details the main events of the Stuart period from the accession of James I, VI of Scotland to the death of Queen Anne in 1714. James VI of Scotland became King James I of England, Ireland and Wales after Elizabeth I died. James was the son of Mary Queen of Scots and Lord Darnley, grandson of Henry VIII‘s sister, Margaret. James’s eldest son, Henry became Duke of Cornwall on his father’s accession. As had been previously agreed with Robert Cecil, James kept membership of the Privy Council the same as it had been under Elizabeth I. King James I left Edinburgh for London. He stopped at the houses of many leading nobles along the route and received a warm welcome. This was a plot by a number of Catholic priests and Puritans who wanted greater tolerance for their religions and aimed to kidnap James. It is called the Bye Plot due to its being a part of another plot (the Main Plot) and was uncovered after details were leaked. This was a plot by a number of courtiers to remove James from the throne and replace him with his cousin, Arabella Stuart, granddaughter of Margaret Douglas and Matthew Stewart. It is called the Main Plot because the Bye Plot was a part of it. It was uncovered after the Bye Plot had been discovered. Walter Raleigh was arrested on a charge of treason for his part in the Main Plot. He was imprisoned in the Tower of London. James and his wife, Anne of Denmark, were crowned King and Queen of England at Westminster Abbey. King James made a request to unite England and Scotland and be named King of Great Britain but this was refused by both the English and Scottish governments. This conference agreed a peace between England and Spain and ended 20 years of war. A plot to assassinate James and the government by blowing up the Houses of Parliament on the day of the state opening of Parliament by the King, was uncovered. Guido Fawkes and the other perpetrators were executed. James encouraged a number of Protestants to settle in Ulster, Ireland. Around 300 Protestant Scots settled in Antrim. Jamestown, Virginia was founded when English colonists led by Captain John Smith settled in North America. It was named after King James. James’s eldest son, Henry, was created Prince of Wales and Earl of Chester in a ceremony at Westminster Abbey. The King James Authorised Version of the Bible was published. King James removed his mother’s body from Peterborough Cathedral and had it re-interred in Westminster Abbey. The heir to the throne, Prince Henry, died of typhoid. His younger brother, Charles became heir to the throne. James’s daughter, Elizabeth married Frederick V, Elector of Palatine at the Chapel Royal, Whitehall Palace, London. The playwright, William Shakespeare, died. King James’s son, Charles, was invested as Prince of Wales and Earl of Chester at Whitehall Palace, London. King James returned to Scotland and attempted to impose Anglicanism in Scotland. The move was strongly resisted by most of the Scottish clergy. The adventurer, Walter Raleigh, was executed for disobeying James’s orders and attacking the Spanish in South America. King James’s wife, Anne of Denmark, died from dropsy at Hampton Court Palace, London. King James’s daughter, Elizabeth and her husband Frederick of Palatine were deposed and exiled from Bohemia by the new Holy Roman Emperor, Ferdinand II and Spanish troops invaded the Rhineland. A group of Puritans set sail for America in the Mayflower. They landed at landed at Plymouth Rock, Massachusetts. King James called for Parliament to grant him funds for military support for his daughter and son-in-law. Parliament granted the funds but called for James to declare war on Spain and for James’s son, Charles to marry a Protestant. James was angry with Parliament for imposing conditions on the grant of money and dissolved parliament. King James died at Theobald’s House after contracting dysentery. He was succeeded by his son Charles who took the throne as King Charles I.
James was buried in Westminster Abbey. Captain John Powell landed on the Caribbean island of Barbados and claimed it for England. Charles I married Henrietta Maria, daughter of Henry IV of France at St Augustine’s Church, Canterbury, Kent. The marriage was not popular because she was a Catholic. Under the terms of the marriage treaty it was agreed that Henrietta Maria could remain a catholic but their children were to be raised as Protestants. Charles was crowned King of England at Westminster Abbey. Henrietta Maria refused to take part in the ceremony because it was a Protestant ritual. Parliament protested to King Charles I about the behaviour of Buckingham calling for him to be removed from office. Charles refused to comply and resented Parliament’s interference with his choices. Rather than dismiss Buckingham Charles chose to dismiss parliament. King Charles I imposed a forced loan to raise money for the war in France. Five knights, Thomas Darnell, John Corbet, Walter Earle, John Heveningham and Edmund Hampden challenged the King’s right to impose taxation independently of parliament. The court found in the King’s favour. Parliament formed a committee of grievances and prepared a Petition of Right which was presented to the King. The Petition was designed to protect subjects from any further taxation unauthorised by Parliament. Charles reluctantly signed the document. King Charles’s favourite, George Villiers, 1st Duke of Buckingham, was stabbed to death by naval lieutenant John Felton. Charles was deeply upset by the death of his friend and secluded himself in his bedroom for two days. 1.That they would condemn any move to change religion. 2. That they would condemn any taxation levied without Parliament’s authority. 3. That any merchant who paid ‘illegal’ taxes betrayed the liberty of England. King Charles’s response was to dismiss Parliament. King Charles I arrested nine members of the Commons for offences against the state. Three were imprisoned. This action by the King made him more unpopular. The King, defended his action by stating his belief in his own divine right saying that ‘Princes are not bound to give account of their actions, but to God alone.’ He then dissolved parliament. A son, Charles, was born to King Charles and Henrietta Maria at St James’s Palace, London. Charles appointed William Laud as Archbishop of Canterbury. Laud was known to have Catholic leanings and Charles hoped that his appointment would help to stop the rise of the Puritans. The appointment concerned Parliament who saw it as a move towards Catholicism. A son, James, was born to Charles and Henrietta Maria at St James’s Palace, London. This was a tax traditionally paid by coastal towns in times of war to pay for the defense of the coast. In a bid to raise more money, Charles now imposed the tax on the whole country. King Charles ordered that the Book of Common Prayer be used in all Scottish churches. It was widely resisted by the Scottish clergy and people. There were riots in Edinburgh against the use of the Book of Common Prayer. A National Covenant was formed which protested against any religious interference in Scotland by England. The Bishops installed in Scotland by James I were expelled. John Hampden, challenged the King’s right to impose Ship Money but he lost the case and the court ruled that the King was the only authority that could impose such a tax. Charles I announced that he intended to raise an army against the Scots to enforce his aims on Scotland. War broke out between Scotland and England over King Charles’ move to impose his aims on Scotland. Parliament had refused to grant Charles money for the war with Scotland and as Charles had been unable to defeat the Scots he was forced to agree a temporary truce. Oliver Cromwell was elected Member of Parliament for Cambridge. He openly criticised King Charles’s taxes and the level of corruption in the Church of England. Charles had summoned parliament in a bid to raise money to renew the war with Scotland. When the new parliament sat for the first time its members determined to force Charles to settle their grievances with his rule. In a bid to appease parliament, Charles agreed to abandon ‘ship money’ but parliament did not feel this went far enough. Charles became frustrated that his terms were not agreed to and dismissed parliament. A Scottish force invaded England, defeated the English force and captured Northumberland and Durham. This treaty between Scotland and England allowed the Scots to stay in Durham and Northumberland until a final settlement was concluded. The Scots had invaded England and King Charles had no choice but to recall Parliament because he needed money to pay for an efficient army to defeat the Scots. However, once again, Parliament refused to grant him any money unless he agreed to their demands which included an agreement that parliament should meet once every five years and the arrest of Thomas Wentworth, Earl of Strafford, for treason. Charles had no choice but to comply. Parliament was very critical of the King’s handling of matters in both Ireland and Scotland and passed propositions that Parliament and not the King should be responsible for the country’s defence. Parliament also abolished the Court of Star Chamber, the Council of Wales, the Council of the North and the Court of High Commission. A Catholic rebellion broke out in Ulster and quickly spread across the country. Many Protestant settlers were driven from their homes and the rebellion became war. This document, put together by Pym, listed all Parliament’s grievances against the King since his reign began. King Charles instructed his attorney-general to issue a charge of treason against one peer and five members of the House of Commons including Pym and Hampden. When Parliament refused to recognise the charge, Charles sent a troop of horsemen to make the arrests. However, Parliament had been warned and the five men had fled. This move by Charles was extremely unpopular and across the country people declared themselves for Parliament and against Popery. The Nineteen Propositions were issued by Parliament in the hopes of reaching a settlement with the King. They called for a new constitution recognising their own supremacy; demanded that ministers and judges should be appointed by Parliament not by the King and also that all Church and military matters should come under the control of Parliament. King Charles I rejected the Nineteen Propositions. Charles raised his standard at Nottingham formally declaring war on parliament and beginning the English Civil War. However, both sides hoped that either war could be averted or that one decisive battle would put an end to the matter. In the early afternoon, Charles sent his army down the hill to meet the Parliamentary army commanded by Essex. On the royalist right was Prince Rupert who broke Essex’s left flank. In the centre, reinforcements arrived and they managed to push forward putting the lives of the King’s sons, Charles and James, in danger. The battle was a stalemate with neither side able to advance. The Parliamentarians led by Essex were marching to Newbury, a town sympathetic to the Parliamentarians, to rest. Unfortunately, Prince Rupert had already reached Newbury and so Essex was forced to fight. He moved the Parliamentarians before daybreak and secured the ‘Round Hill’, just south of Newbury. The surrounding countryside was criss-crossed with lanes and hedgerows which offered excellent cover for the foot soldiers but was quite unsuitable for horse. The battle was won by the Parliamentarians. This document swore to preserve the Church of Scotland and to reform the religion of England and Ireland ‘according to the word of God and the example of the best reformed churches’ and to protect ‘the rights and liberties of parliaments’. This was the largest single battle of the Civil War involving 45,000 men. Although the Royalists led by Prince Rupert were outnumbered, they decided to fight. They were defeated by a Parliamentarian force led by the Earl of Leven. For the first time since the Civil War had began Rupert’s cavalry were beaten by a Parliamentarian cavalry charge. The Royalists were sandwiched between two Parliamentarian forces but each time the Parliamentarians made some gain they were beaten back by the Royalists. The battle, which lasted all day, ended in a draw. Archbishop Laud was executed after being found guilty of treason. Parliament ordered the creation of a army whose structure was to be based on ability rather than class and position. Regular drills ensured that the army was professional and very competent. The Parliamentarians broke their siege on Oxford and forced the Royalists into battle. Initially the Royalists took up a defensive stance but later the order to attack was given. The battle lasted just three hours and saw the death of most of the Royalist foot soldiers. It was a decisive victory for Parliament. Charles fled the battlefield as soon as it was apparent that he had lost both the battle and the war. The New Model Army lay siege to the Royalist capital of Oxford where Charles was resident. However, Charles managed to escape dressed as a servant and fled to Scotland. Charles I surrendered to the Scots at Newark and they took him north to Newcastle. This was a series of debates held by different Parliamentarian forces to try to decide on a new constitution. Unfortunately it was impossible to find agreement between the different factions. Charles I escaped imprisonment and fled to Carisbrooke Castle, Isle of Wight. Charles made a deal with Scotland whereby the Scots would invade England and help him to retake the throne. In return Charles agreed to change the religion of England to Presbyterianism. War broke out again when John Poyer, former parliamentary soldier and Governor of Pembroke Castle refused to hand over his command to General Fairfax. Like many others, he was dissatisfied with the disorder and lack of stability over the last two years. The Scots invaded England as agreed with Charles. This was a battle between the New Model Army commanded by Oliver Cromwell and a combined army of Royalists and Scots commanded by the Duke of Hamilton. The two day battle was won by Cromwell’s forces. Following this battle Royalist forces in England surrendered to Cromwell. Although Parliament voted to negotiate with Charles, Cromwell and the army refused to negotiate. Colonel Thomas Pride forcibly removed all members of Parliament that did not support the army and Cromwell. This parliament was formed from those members that had not been expelled by Thomas Pride in December. All were army loyalists and voted to give parliament the right to make new Acts of Parliament without the king’s approval. They also indicted King Charles on a charge of treason. King Charles I was executed by beheading, in front of the Banqueting House at Whitehall Palace, London. He was buried in St George’s Chapel, Windsor. The Scottish parliament proclaimed Charles I’s son Charles, King Charles II of Scotland. The Rump Parliament declared England to be a republic. Those Royalists that were against parliament and believed that Charles’s son, Charles was now King, went to Ireland where they raised support among the Irish Catholics. Oliver Cromwell was nominated by parliament to go to Ireland and take control. After an eight-day siege Cromwell took the town of Drogheda in Ireland. His troops massacred thousands of people. After a nine-day siege, Cromwell’s troops sacked the town of Wexford killing around 3,500 people. The Scots forced Charles II to agree to make England Presbyterian in return for Scottish support to restore the monarchy in England. Although this pacified the Scots it reduced Charles’s support in England. Charles was crowned King of Scotland at Scone. Charles II managed to evade Cromwell’s forces and invaded England with the intent of capturing London. As soon as Cromwell realised Charles had gone south he left Scotland in pursuit. Cromwell met Charles II’s forces at Worcester. Cromwell secured victory. Charles managed to avoid being captured by hiding in an Oak tree. He then fled to France. Charles travelled around Europe trying to find support to mount a campaign to take back control from Cromwell. As France, Holland and Spain refused to back him he had no choice but to remain in exile. Oliver Cromwell, was appointed Lord Protector of England for life. The title gave him full control over government and the judiciary. Britain seized the island of Jamaica from Spain. Oliver Cromwell died in the Palace of Whitehall from a fever. He was succeeded by his son, Richard Cromwell. Richard Cromwell was removed from power by the army who reinstalled the Rump Parliament (the parliament that had tried King Charles I for treason). Samuel Pepys, a naval administrator, began his diary. 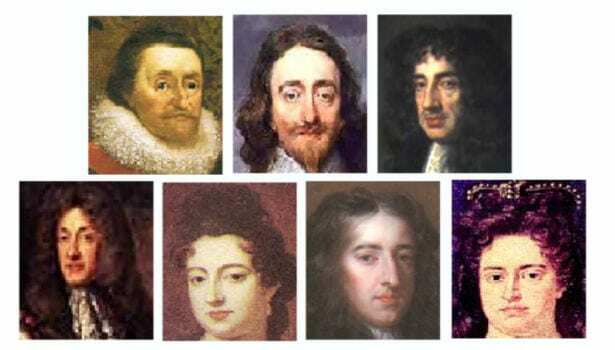 The newly elected parliament contained many members who supported a return to monarchy and Monck persuaded them to restore Charles II to the throne. It was publicly announced that by the terms of this document, Charles declared that he agreed to a general amnesty for those that had supported Cromwell and Parliament, freedom of conscience, an acceptable settlement of land disputes and full payment of arrears of pay to the army. Charles was proclaimed King Charles II by parliament. Charles’s brother, James, married a heavily pregnant Anne Hyde, daughter of Edward Hyde. The Royal Society was founded to promote scientific advancement. Charles was crowned King of England at Westminster Abbey. A marriage treaty with Portugal agreed the marriage of Charles II to Catherine of Braganza. England was to receive Tangiers in North Africa, the Seven Islands of Bombay as well as trading rights in Brazil and the East Indies as well as a £300,000 cash payment. In return England would provide military support for Portugal in its war with Spain. Catherine, who was a Catholic, would be allowed freedom of worship. Charles took no part in the negotiations and was totally disinterested in the marriage other than for its political value. This act enforced the use of the Anglican Book of Common Prayer. Four English ships sailed into the harbour at New Amsterdam demanded the surrender of the New Netherlands (Dutch possessions in North America). Peter Stuyvesant, governor of New Amsterdam, signed New Netherlands over to the English. New Amsterdam was renamed New York after King Charles II’s brother, James, Duke of York. A serious outbreak of Bubonic Plague reached London killing thousands of people. Most rich people immediately left the city. A fire broke out at a bakers in Pudding Lane. It destroyed more than 13,000 houses and 87 churches including St Paul’s Cathedral. The Dutch made a surprise raid on English battleships that were anchored off Chatham. Charles lost a number of ships and was forced to sue for peace. Charles chose five politicians to advise him; Clifford, Arlington, Buckingham, Ashle and Lauderdale were collectively referred to as the Cabal (an acronym of their initials). Charles granted the East India Company the right to acquire territory, mint money, command fortresses, make laws and use force to protect its assets. The Royal African Company was granted a monopoly in the transportation of slaves from Africa to North America and the Caribbean and their exchange for rum, tobacco, cotton and sugar. This act stated that anyone in public office had to swear an oath of allegiance and could not be a Catholic. There was growing concern over the succession since Charles II had no legitimate children. Heir to the throne was Charles’s brother, James who had converted to Catholicism. In a bid to persuade people that the royal family were not Catholic, Charles insisted that James’s daughter Mary be married to her cousin William III of Orange. Titus Oates claimed that there was a plot to assassinate Charles and replace him with his brother James who had converted to Catholicism. The rumour sparked a wave of anti-Catholic hysteria and supposed conspirators were executed. The 1673 Test Act was extended and effectively barred Catholics from being members of either the House of Commons or the House of Lords. This Act, which states that no one can be imprisoned without a trial, was passed by parliament. A group of MPs introduced an Exclusion Bill into parliament in a bid to exclude Charles’s Catholic brother James from the succession. Some supporters of the bill felt that Charles’s eldest illegitimate son, the Duke of Monmouth, should succeed to the throne. Rather than allowing the bill to pass, Charles dissolved parliament. Parliament, when recalled, continued to be divided over the succession of James. Those that supported the Exclusion Bill were known as Petitioners (later to become the Whigs) while those that opposed the bill were called Abhorrers (later to become the Tories). This was a plot to assassinate King Charles and his brother James while they were at the races at Newmarket. However, a fire in Newmarket led to the cancellation of the races and the plot failed. The uncovering of the plot also led to a wave of sympathy for Charles and James. Charles died. He was succeeded by his brother as James II. This rebellion was planned by James Scott, Duke of Monmouth, illegitimate son of Charles II, and linked with Argyll’s Rising led by Archibald Campbell, Earl of Argyll. The two men planned a rebellion against James II and his replacement by Monmouth. The Earl of Argyll sailed from Holland bound for Scotland with a force of 300 men. He intended to incite a rebellion against the rule of James II and have him replaced by Charles II’s illegitimate son, the Duke of Monmouth. The Earl of Argyll was captured by forces loyal to the King. He was executed for treason. The Duke of Monmouth’s forces were defeated by royalist forces led by the Earl of Feversham and John Churchill. The Duke was captured and executed. The Bloody Assizes were a series of trials through August and September where those who had taken part in the Monmouth Rebellion were tried by Judge Jeffreys. Around 1500 people were tried, 300 were executed and around 850 were transported to the West Indies. This allowed religious freedom in Scotland and dispensed with the requirement for oaths as prescribed by the Test Act. This allowed religious freedom in England and dispensed with the requirement for oaths as prescribed by the Test Act. A son, James Francis Edward, was born to James and his second wife, Mary of Modena at St James’s Palace, London. The birth of James’s son secured the succession but also meant that there was a very strong likelihood that Catholicism would return to Britain. Seven Protestant nobles, Earl of Shrewsbury, Earl of Devonshire, Earl of Danby, Viscount Lumley, Bishop of London, Edward Russell and Henry Sydney, wrote to William III, husband of James II’s daughter Mary and asked him to join them in making Mary heir to the throne in place of the newborn prince. William was told that if he landed in England with a small army he would find that he had much support. William of Orange landed at Brixham in Devon. After the army and navy defected to William, James decided not to march to meet him. Parliament agreed that since James had fled abroad he was deemed to have abdicated. Both of James’s daughters refused to rule over William so it was agreed that William and Mary should jointly take the throne as William III and Mary II. James II landed in Ireland at the head of a French force determined to regain the crown. The Irish government declared that James remained King. James’s supporters were known as Jacobites. This act granted freedom of worship to those Protestants who had split from the Church of England such as Baptists, Congregationalists and English Presbyterians. The act did not extend to Roman Catholics. This battle was fought between the Jacobites and the Scottish Government army. Although Dundee was killed and Jacobite losses were large, the Jacobites won the battle. However, those that survived were unable to mount further resistance to the rule of William and Mary. This battle saw the Scottish Government army victorious over the Jacobites in Scotland. The English parliament drew up this bill which stated basic civil rights and settled the succession. It also stated that no Roman Catholic could take the throne nor could an English monarch marry a Roman Catholic. In Ireland the forces of William III secured a decisive victory over thos of James II. James managed to escape the battlefield and fled to France. In Scotland, the chiefs of the Highland clans were ordered to swear an Oath of Allegiance to William and Mary. The deadline for taking the oath was 1st January 1692. This treaty ended Jacobite resistance in Ireland leaving William in control of the country. Jacobite soldiers were given the option of joining William’s army, going to join James in France or going home and living peacefully. The majority, around 14,000 went to France. The chief of the MacDonald clan of Glencoe had put off taking the Oath of Allegiance. He now reluctantly decided to take the Oath and went to Fort William. However, when he arrived he was told that a sheriff needed to be present and that the nearest sheriff was 40 miles away. MacDonald did not reach the sheriff until after the 1st January deadline. Unaware that MacDonald had taken the Oath of Allegiance, John Dalrymple, Secretary of Scotland ordered the elimination of the Glencoe clan. After spending a number of days as guests of the Glencoe MacDonalds, Campbell of Glenlyon massacred 40 MacDonald men, women and children. The Bank of England was established to act as the government bank. Mary II, died of smallpox. Her husband William III succeeded as sole monarch of Britain. William survived an assassination attempt by the Jacobites led by John Fenwick. Fenwick was later executed for treason. William, Duke of Gloucester, only surviving son of William’s sister-in-law, Anne, died. This act stated that the succession would pass to the heirs of Sophia, Electress of Hanover, Protestant granddaughter of James I if Anne died without an heir. William died from pneumonia which he contracted after suffering a broken collar bone following a fall from his horse. He was succeeded by his sister-in-law Anne. Anne was crowned Queen at Westminster Abbey. She was suffering from gout so was carried to the Abbey in a sedan chair. England declared war on France, allying with Austria and the Dutch Republic in the war to determine who would succeed to the Spanish throne. John Churchill, Duke of Marlborough, secured an allied victory over France. This act, in response to Scotland’s Act of Security, stated that all Scots in England would be consider aliens and their properties may not be able to be inherited. The act included a clause that stopped Scottish imports to England and its colonies. The Scots were told that if they would enter negotiations for an Act of Union the Alien Act would be suspended. This act formally united England and Scotland as Great Britain to be governed by one parliament. The flag created by King James I, known as the ‘King’s Colours’, which was used by the navy, was now declared to be the national flag of Great Britain. It became known as the Union flag. The rebuild of St Paul’s Cathedral which had been badly damaged in the Great Fire of London was declared completed. The new Cathedral had been designed by Christopher Wren. This treaty ended the war. However, in order to get it to pass, Anne had been forced to create twelve new Tory peers. Anne died at Kensington Palace, London. Her death ended the Stuart dynasty. As per the terms of the Act of Settlement 1701, George, Elector of Hanover became King of Great Britain.